Discover the magic number and how it adds up to savings! Here’s the quick answer: 78 degrees. That’s the temperature the U.S. Department of Energy recommends for setting your thermostat while you’re at home. But what if 78 is too hot or too cool for your personal comfort level? No worries. Here are a few tips to help you turn up the heat (even a little) and lower your energy bills this summer. Turning up your thermostat when you go to work or prep your home for vacation may seem simple, but there are a couple of pointers to keep in mind to make sure you have the proper “away temperature”. Shoot for a higher inside temperature that’s closer to the temp outside. This will slow down the flow of heat into your home and make it easier for your A/C to work efficiently. If you set your thermostat 7-10 degrees above your normal setting while you’re away, you could save as much as 10% on your electricity bill. That said, if you have pets at home, make sure you keep it cool enough for them to be comfortable. Try switching to a programmable thermostat, so you can automatically raise the temperature when you go to work and start cooling your house before you get home. For every degree you raise your thermostat above 72 degrees, you’ll save up to 3% of your cooling expenses. Setting it and forgetting it with a programmable or smart thermostat is a no-brainer that can help reduce energy expenses this summer and year-round. Even when you’re setting your thermostat higher, you may not see your electric bill go down if your air conditioner isn’t running efficiently. 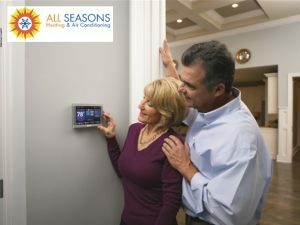 Start small by reaching out to an All Seasons Heating and Air expert, and have us come check your unit to make sure it’s operating at its best. Small things like leaky air ducts, poor insulation or overgrown landscaping around your air conditioner can affect efficiency. Maybe an HVAC upgrade is the right move for you. A newer Energy Star certified system that has a high Seasonal Energy Efficiency Ratio (SEER) and Energy Efficiency Ratio (EER) rating will be 15% more efficient than older, less energy-conscious models. Newer systems can also improve your comfort, since they typically feature 2-stage cooling and a variable-speed fan. This type of air conditioning system will keep you cooler more consistently, even on a lower setting. It also runs longer without the starts and stops that use excess energy and removes twice as much humidity from your air to keep you feeling more chill. If you’re on a budget or want a fast fix, here are some quick non-tech tricks to lower the temperature in your home. Using ceiling fans can make a room feel 4 degrees cooler. Which means you can turn up the thermostat a few more notches to save money. Close shades, blinds and curtain to keep the sun out during the day. Blackout shades and curtains work wonders. Open windows and turn off your air conditioner at night to let in cooler air. Then shut the windows and shades in the morning to trap the cool air in your house. Weatherstrip doors and windows to keep cool air in and hot air out. Only use heat-generating appliances like your stove, oven, dryer and hair dryer after 8pm to avoid heating up an already hot house. Appliances can raise the temperature up to 10 degrees! If you’re really committed to turning up the temp while you’re home, ease into it. It can take time to for your body to adjust to a warmer environment. Try raising the temperature by one degree every day or two, until you get to 78. Also, remember that humidity can make you feel hotter. So be sure to keep the A/C on, even at a higher temperature, to help draw humidity out of the air. Still curious about how your thermostat and air conditioning system work? Learn more about HVAC basics from the experts at All Seasons Heating an Air Conditioning. Schedule your seasonal maintenance today! Quick, fast, courteous and very informative. Was able to get an appt quickly too. These guys are great! Phenomenal work at a reasonable price. I will refer to my family and friends. Great service for several years now. Gerry does what he says he will do when he says he will do it. Very professional and knowledgeable. I will not call anyone else. You can read more or leave your own reviews on Facebook. Website created by The Childress Agency.